The most seasoned genealogists know that newspapers are an essential part of their investigative resources, and you should too! Think about it - every single day in the history of our American ancestors, a newspaper was published. Over two centuries of publication have given us a millions upon millions of articles. Together, they create as complete a picture of the world of our ancestors as we will ever have. Not only are newspapers full of the main thing all genealogists crave – good stories – they offer rare insight into the way our ancestors thought and reacted to the world around them. If you want to truly understand your ancestors, you need to immerse yourself in the news of their times. But there's so much more than just that. The beauty of newspapers is that they're unofficial sources. That might sound surprising, but you will quickly see that amazing details emerge when the record maker isn't bound by the forms and fields of an official document. Newspapers capture details you would never dream of finding in an official record. But even for those steadfastly dedicated to hunting official records, newspapers can also provide valuable clues in tracking down missing documents. Let's take a look at how newspapers can supplement or complement your family's birth, marriage and death details. One advantage of searching historical newspapers is that they often pre-dated official government record keeping. For your earliest ancestors, newspapers may be the only place you can hope to find details about family births. What's in newspapers always varies depending on geographic area and time period – sometimes the way they cover events differs even based on the particular editor at the time. Always keep this in mind and remember – just because you can't find a birth announcement for one ancestor doesn't mean that you'll come up empty for another one. You really need to search for everyone (but not all at once!). That said, birth announcements were common in historical newspapers. In general, they contain information about the baby's name, birth date and parent's names. Sometimes they will include details like the religion of the family, or interesting circumstances surrounding the birth. Unlike obituaries, there isn't a consistent section where birth announcements tend to appear. You will often find them in classified ads – families would pay for a congratulatory announcement here. Some papers will have a dedicated section to such announcements. Newspapers offer even more help for marriages. 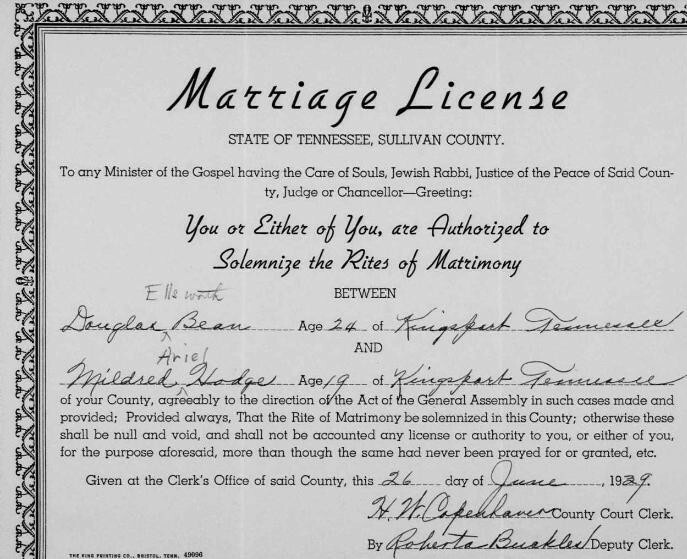 If you're unable to find a marriage certificate in our exclusive collection of U.S. marriages records, turning to newspapers could help solve that mystery. It was actually quite common for couples to marry out of state or out of county, especially in areas with restrictive marriage laws. You may find a couple based in New York that married in Ohio. Without finding the coverage in a newspaper, you may never know to look in Ohio for their marriage instead of New York. Recently, Cheri Hudson Passey, wrote of a surprising marriage record she unexpectedly found in a neighboring state. As we mentioned before, information in official forms is limited to the fields available. While this marriage record is a very valuable piece of genealogical proof, the details are a little ho-hum - we can't even see the parents' names. The right article will lead you to previously unknown names, relationships, locations and dates, creating new avenues for further research in addition to bringing the event to life. These kinds of details are most likely to be found in a small town newspaper – in bigger metropolitan areas, there were simply too many other things to write about and the space was rarely dedicated to a huge level of detail, unless your ancestors were well-known individuals. 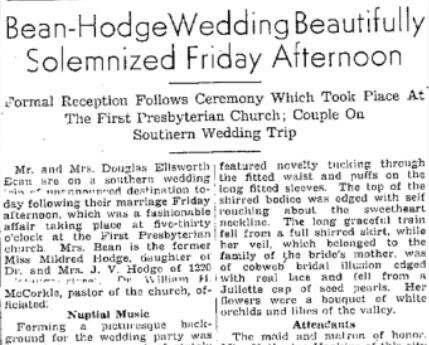 However, you can still find marriage license announcements in larger metropolitan newspapers as well as small town ones - while these announcements don't always provide much detail, finding one could be essential for tracking down a record. Obituaries are the crown jewel record that can be found in newspapers, and are arguably one of the most useful pieces of genealogical material you can find. This is because for many of our ancestors, their obituary is the only complete biographical description of their life that exists. Obituaries can often tell you date and location of birth, often down to the town or county. This is incredibly valuable information, especially if you're trying to trace your immigrant ancestors. Indeed, a good obituary can open the door to an entirely new country to research. Obituaries typically contain many notable events or stories from an ancestor's life. You will also find information on the ancestor's marriage, their children and circumstances of death. This can lead to discovery of more records. You may discover your ancestor died further from home than you realize – this information can help you locate an elusive death certificate if you've had trouble finding it in your ancestor's hometown. Also, the description of a sudden death can indicate there's a coroner's report to be found. If you aren't including newspapers in your genealogy searches, you're really missing out. Not only can they help locate missing records or fill in gaps for those that don't exist, you will learn amazing details about the lives of your ancestors that you can't find anywhere else.